Image around SN 2012dn obtained by the Kanata Telescope at Higashi-Hiroshima Observatory. SN 2012dn is seen near the center of this figure. The host galaxy ESO 462-G016 is seen on the left side of SN 2012dn. The distance to this galaxy is known to be 130 mega-light-years. Because the supernova is a point source, the expansion cannot be measured, but the evolutions of the brightness and color are obtained. Astronomers using the OISTER telescope consortium in Japan have uncovered new information about the origin of 'extraordinary supernovae' explosions, which are brighter than normal ones. This new information will help improve measurements of the Universe's expansion, and of the Dark Energy which controls the final fate of the cosmos. Type Ia ("One-A") supernovae are a type of exploding star which are used as references when studying the Universe. What makes these supernovae useful is that the physics governing their evolution ensures that they all change from a stable state to an explosion at almost exactly the same point in their evolution. This means that the brightness of a Type Ia supernova explosion is consistent from one star to the next. By using the known brightness of these supernovae, astronomers can use them to calibrate observations. For example, in the late 1990's, the accelerating expansion of the Universe was discovered by using the properties of Type Ia supernovae. Drs. Perlmutter, Riess, and Schmidt were awarded the Novel Prize in Physics in 2011 for this work. But it turns out there's a problem with this method. In addition to normal Type Ia supernovae, astronomers have discovered 'extraordinary supernovae' which are much brighter than they should be. These 'extraordinary supernovae' may be contaminating the samples used for cosmological research, thereby skewing the calibration. To correctly measure the expansion of the Universe and understand the Dark Energy driving the expansion, it is important to determine the origins of both typical supernovae and 'extraordinary supernovae' so that the latter can be more accurately excluded from the sample. Despite three decades of debate, astronomers still haven't agreed on the origin of these supernovae. There are two popular scenarios, 'accretion' or 'merger', as the path to the supernova explosion. Both scenarios consider a 'binary system,' i.e., two stars orbiting around each other. The 'accretion' scenario uses binary systems composed of one white dwarf and one normal star, and the 'merger' scenario uses binary systems formed by two white dwarfs. When the 'extraordinary supernovae' candidate SN 2012dn (Figure 1) was spotted, Masayuki Yamanaka, a Taro Hirao Foundation Researcher at Konan University, and his colleagues observed it using 11 telescopes in Japan through OISTER (Optical and Infrared Synergetic Telescopes for Education and Research, Figure 2). The observations continued until 150 days after the supernova was first observed. As a result of this observing campaign, they discovered an anomalously strong infrared emission for this object which cannot be seen in typical supernovae. The groups performed detailed analysis of the infrared emission, and concluded that material ejected recently from the progenitor system is responsible for this emission. The mass of the ejected material strongly supports the 'accretion scenario.' In the accretion scenario, gas is transferred onto the surface of the white dwarf from the companion star in the binary system. During the transfer, a part of the material escapes from the gravitational potential of the system, forming a dense gas surrounding the pre-supernovae-explosion star system. 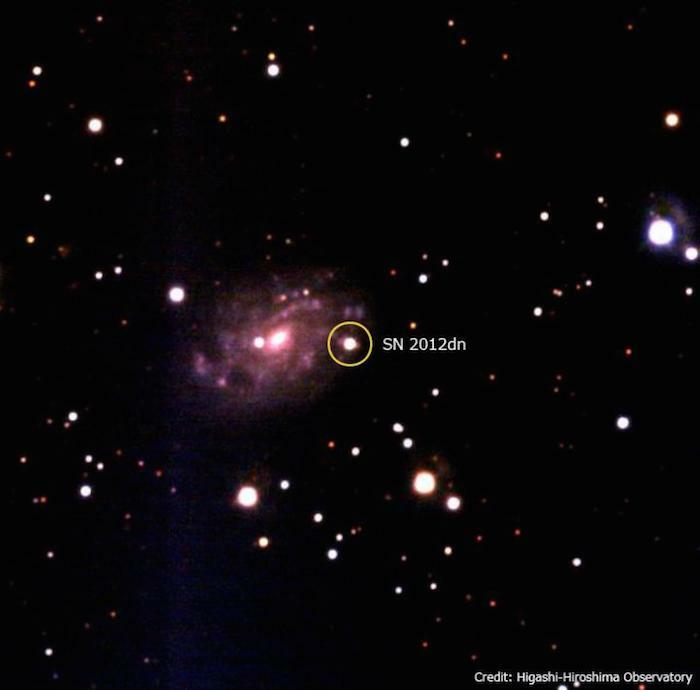 The observation results indicate that SN 2012dn exploded while surrounded by this dense gas. From here, the team will pursue new observations to determine if typical Type Ia supernovae are also the results of accretion.